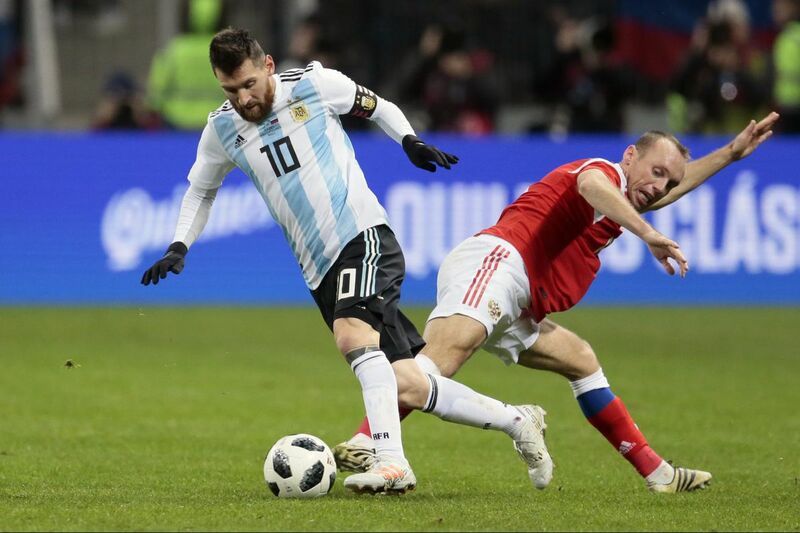 Argentina’s Lionel Messi will be one of the biggest stars at the 2018 FIFA World Cup in Russia. NEW YORK — Comcast's Telemundo announced Tuesday that it has sold more than 75 percent of its advertising inventory for the network's Spanish-language broadcasts of this summer's World Cup in Russia, and expects to sell the rest well before the tournament starts in mid-June. Though the network did not say how much money that adds up to, it did say that it has 20 sponsors on board, including three flagship brands in Coca-Cola, Sprint and Volkswagen. Each will have a title sponsorship of a part of Telemundo's studio coverage, such as half time shows or post game wrap-ups. Laura Molen, executive vice president of NBCUniversal's Lifestyle and Hispanic advertising sales group, said the network was only allowed to sell to FIFA's official sponsors (Coca-Cola is one) until last June. Once the wider window opened, she said there was "great interest" until the Super Bowl and Olympics, when advertisers – as well as NBCUniversal's sales staff – shifted attention to those properties. Since then, Molen said, "the last couple of weeks, the phone has been off the hook." She projected that inventory would sell out "before the month of June." One benchmark for Telemundo to aim for is Univision's reported ad revenue from the 2014 World Cup: $174.2 million, according to SEC filings. Molen and other executives also wouldn't put specific numbers on the network's audience projections. But they think they can beat what Univision did during its more than four decades as the World Cup's U.S. Spanish-language home, and those numbers set a high bar. Univision drew at least five million viewers for 10 games at the 2014 World Cup, including a network record of 10.4 million viewers for the Mexico-Netherlands round of 16 game. The last three World Cup finals – 2014, 2010 and 2006 – drew 9.2 million, 8.8 million and 5 million fans, respectively. Telemundo Deportes executive vice president Eli Velazquez has been building to this moment ever since 2011, when the network secured an eight-year contract with FIFA from 2015 through 2022. The contract was later extended through 2026. "I think we've closed the gap on awareness that we're owners of the World Cup rights in Spanish," Velazquez said. "We're making sure that we're providing coverage and content in all of the places [where] today's consumer wishes to consume." That includes constant promotion on Telemundo's newscasts and other shows, as well as English-language ads on NBC's broadcasts of English Premier League soccer, the Olympics and even last month's Super Bowl. Telemundo will televise 56 of the tournament's 64 games on its flagship broadcast network, and the remaining eight – all simultaneous kickoffs with other games – on cable channel Universo. Online streaming will likely follow NBC's tradition of being behind a TV provider authentication wall, but Velazquez said some of it might not be. "I think there will be a period of un-authenticated coverage," he said. There will be four broadcaster teams, all based in Russia, and six reporting crews traveling around the tournament. Expect an emphasis on teams with big immigrant populations in the U.S., and with big Spanish-speaking stars. Mexico will be foremost, then Lionel Messi's Argentina, Cristiano Ronaldo's Portugal and Neymar's Brazil. The other North and South American teams — Costa Rica, Panama, Colombia, Peru and Uruguay — will also get time in the spotlight. The United States will be noticeably absent from the party. But while Velazquez personally will miss them, Telemundo as a whole might not. "We would have loved for the USA to be in this tournament," he said. "We're not dwelling on the fact that they're not participating. We're being even more bullish in our attempt to make sure that every fan here of U.S. soccer who will invariably follow other teams during the tournament is just as engaged and entertained, because they love the beautiful game."